Fly to several destinations via Airphil Express for only 1 peso! 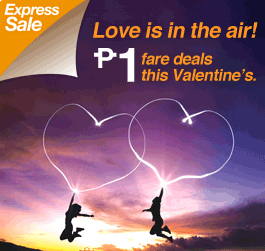 Airphil expresses announces its latest Valentine treat seat sale promo featuring several discounted domestic flights from Manila and Cebu for only 1 peso today February 14, 2012 until February 16, 2012 or until seats last for travel periods September 1, 2012 to December 15, 2012. Until February 16, 2012 or until seats last. I am sure that this tour will please everyone. We need only to have time to make a reservation early to go on such wonderful trip. Wow! That's wonderful tour! I was at Tuguegarao ones and I very liked it. It;s so exotic and old. You can feel the power of time there. I even included my experience to write my research paper for a college class. I got an A+ for it, because it was interesting and unusual.